Hurricane Maria is seen off the southeast coast of Puerto Rico on Tuesday. The storm is expected to make landfall there as a major hurricane. Hurricane Maria, currently headed for Puerto Rico, stunned forecasters by rapidly intensifying from a Category 1 storm to a Category 5 within a 15-hour period on Monday, battering the island of Dominica in the process. Indeed, the forecast error for Maria’s wind speed is one of the worst for a 24-hour hurricane forecast in the past five years. The National Hurricane Center expected Maria to intensify, but not anywhere close to the degree that it did. The center’s 11 p.m. forecast on Sunday night said Maria would be a low-end Category 3 storm with maximum sustained winds of 115 mph when it got close to Dominica on Monday evening. In reality, the wind speed ended up being 160 mph, a forecasting error of 45 mph. The difference in these wind speeds can be the difference between life and death. The National Hurricane Center says that in storms with Category 3 winds, homes will sustain major damage. Category 5 winds can destroy entire homes and leave areas uninhabitable for weeks or months. 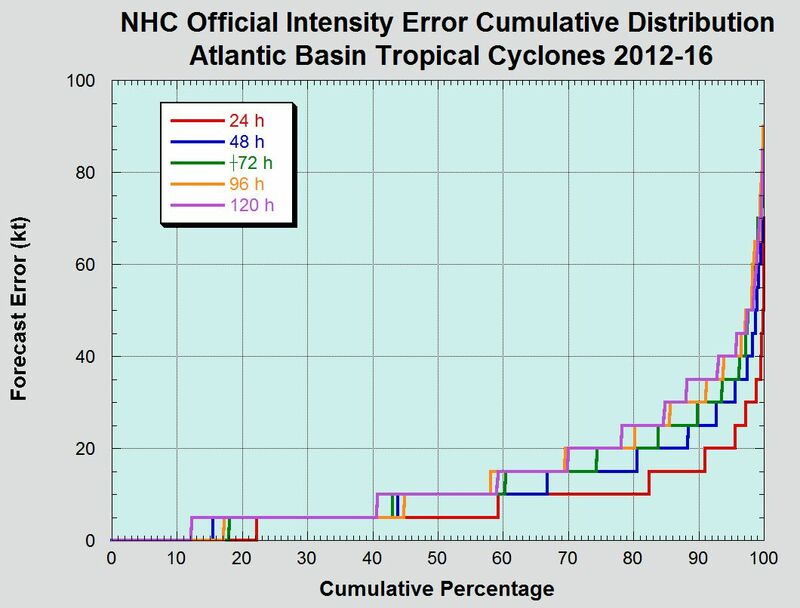 Forecast intensity errors like what occurred with Maria happen very rarely. The average National Hurricane Center 24-hour forecast error for tropical cyclone wind speed from 2012 to 2016 was 9 mph. According to this graphic put together by the National Hurricane Center, more than 95 percent of 24-hour storm forecasts have a smaller wind speed error than the Sunday evening forecast for Maria did. To be clear, it’s not as though forecasters didn’t expect Maria’s wind speeds to increase. Jeff Masters of Weather Underground wrote on Monday morning that the conditions for the storm to develop into a stronger hurricane were there: There was little wind shear (changes in wind direction over short distances), the ocean was warm and the mid-levels of the atmosphere were moist. But forecasters were playing catchup. By late Monday morning, the National Hurricane Center projected Maria to be a Category 4 storm by the time it hit Dominica about 12 hours later — a smaller underestimation than the forecast the night before. A large part of the problem was that weather forecasting models were consistently underestimating how the favorable conditions for hurricane intensification would boost Maria’s wind speeds. Brian Tang, a meteorologist at the University at Albany, told me via email that hurricane models are not good at predicting rapid intensification events such as Maria because so few of them occur. He pointed out, as did forecaster Ian Livingston of The Washington Post’s Capital Weather Gang in an email to me, that this is especially the case for hurricanes with compact cores like Maria’s. Philippe Papin, also a meteorologist at the University at Albany, noted that one model showed Maria had a far greater chance than normal of rapid intensification, even if it wasn’t the most likely outcome. Maria is arguably the second hurricane this season that caught forecasters at least a little off guard before making landfall. Although Hurricane Harvey’s location and wind speed were fairly well forecast in the immediate lead-up to landfall in Texas, the storm essentially came out of nowhere 60 hours earlier. No forecasts for Harvey were even issued by the National Hurricane Center from the evening of Aug. 19 to the morning of Aug. 23. The storm made landfall on the evening of Aug. 25. Even in the 11 p.m. Aug. 23 forecast, Harvey was expected to be only a Category 1 hurricane with maximum sustained winds of about 75 mph on the evening of Aug. 25. Instead, right before landfall, it was a Category 4 storm with 130 mph winds, a forecast error of 55 mph. The average forecast wind speed error from 2012 to 2016 was just 13 mph. A look at the graphic above shows that a 48-hour forecast wind speed error of 55 mph (or about 48 knots) happens less than 5 percent of the time. Unfortunately, the conditions that helped Maria strengthen so quickly are still in place. That means Maria likely won’t weaken much before it hits Puerto Rico. Forecasters and residents are preparing for the very worst.